The state's "Big Three" unveiled the proposal in a joint statement. The idea would need approval from two-thirds of the House and Senate and a majority of Texas voters. Texas' top three political leaders — Gov. Greg Abbott, Lt. Gov. 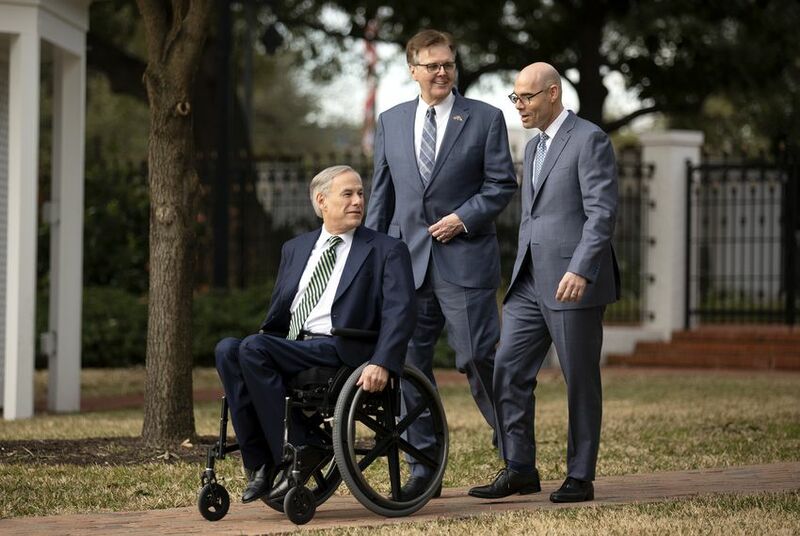 Dan Patrick and House Speaker Dennis Bonnen — threw their support Wednesday behind a proposal to increase the sales tax by 1 percentage point in order to lower property taxes across the state. But that's only if lawmakers agree to limit future local property tax increases. The proposal would raise the state's sales tax from 6.25% to 7.25%, generating billions of additional dollars annually for property tax relief, if voters approve a constitutional amendment. But the idea will be a hard sell to Democrats, since the sales tax is considered regressive, meaning lower-income Texans end up paying a larger percentage of their paychecks than higher-income Texans. "Today we are introducing a sales tax proposal to buy down property tax rates for all Texas homeowners and businesses, once Senate Bill 2 or House Bill 2 is agreed to and passed by both Chambers. If the one-cent increase in the sales tax passes, it will result in billions of dollars in revenue to help drive down property taxes in the short and long term," said a joint statement from the three Republicans. Neither chamber has passed HB 2 or SB 2, which would require voter approval of property tax increases over 2.5%. The House Ways and Means Committee was scheduled to take public testimony on the House's sales tax swap proposal this week but delayed hearing the bills. Rep. Dan Huberty, R-Houston, who authored House Joint Resolution 3 and House Bill 4621, is considering changing the legislation to use a fraction of the additional money generated by the sales tax for public schools — in order to get more Democrats on board. The bills are intended to provide another revenue source to help significantly cut down local school property taxes, which make up more than half of the local property taxes levied in Texas. If the Legislature approves the resolution, the constitutional amendment would go to voters to approve in November, and if voters sign on, the tax rate change would apply in January 2020. The idea is picking up solid but not unanimous support from conservatives. The Texas House Freedom Caucus, the hardline conservative faction of the House, said in a statement that it would back the idea if all the additional money went to property tax cuts and if lawmakers also approve a 2.5% revenue cap on school districts. The caucus also wants to make sure the Legislature passes a bill requiring other local taxing units to get voter approval for property tax increases above 2.5%. “There has to be a firm lid on local property taxes — including schools — that keeps the growth of property taxes from washing out the benefit you get over time,” said Rep. Matt Schaefer, R-Tyler, a member of the caucus. Since the tax swap would require a constitutional amendment on the upcoming November ballot, Huberty would need to convince 100 members — two-thirds of the lower chamber — to vote in favor of the resolution on the House floor. If all 83 Republicans vote yes, he'd also need 17 Democrats. Some Democratic opposition quickly emerged Wednesday. "It's a dangerous idea, one that increases taxes on working families to disproportionately provide tax cuts for corporations and the rich over everyday homeowners," said state Rep. Ramon Romero, D-Fort Worth, a member of the House Democratic Caucus. Romero suggested Republicans instead back a bill he filed to double the exemption homeowners are entitled to on their home values for school taxes, from $25,000 to $50,000, which would give an average yearly tax cut of about $325. Sen. Larry Taylor, R-Friendswood, has filed Senate Joint Resolution 76 and Senate Bill 2441, which would also use an increase in the sales tax to lower school district tax rates. The Senate would need 21 votes to pass the resolution. Raising sales taxes for public education appears deeply unpopular among voters, with 74% of Texans in a recent University of Texas/Texas Tribune poll reporting that the state Legislature should not consider increasing sales taxes to boost public education money. In fact, increasing the sales tax was slightly more unpopular than creating a state income tax, which 71% gave a thumbs down in the poll. Disclosure: The University of Texas has been a financial supporter of The Texas Tribune, a nonprofit, nonpartisan news organization that is funded in part by donations from members, foundations and corporate sponsors. Financial supporters play no role in the Tribune's journalism. Find a complete list of them here. After 20 years of agitating for property tax reform, can Paul Bettencourt pull it off?